The Canal Grande (Grand Canal) or Canalazzo as the local population prefer to call it, with its 3,800 metres in length cuts through the heart of Venice in an inverted-S shape, splitting the city in two. It’s not only the most important canal in Venice; it’s also one of the city’s symbols famous worldwide. Finding a parking space near the Grand Canal isn’t easy, but Parclick can help! Parclick offers you Venice’s best car parks, within easy reach of the Grand Canal. Take a look at the map. Given that the entire city of Venice is visitable only by boat, you can choose to leave your vehicle at Mestre, on the coast, to reach the Grand Canal via Santa Lucia station by train, or by any of the bus lines available, or even to leave your vehicle parked at Piazzale Roma, after crossing Ponte della Libertà (Bridge of Freedom), which is positioned directly on the Grand Canal! The canal can be visited in its entire length thanks to steamboat Lines 1 & 2 of Venice’s public transport (ACTV). The former is more suitable for tourists, whilst the latter is faster and is far more used by Venetian workers. The most beautiful churches and buildings of Venice give onto the Grand Canal, which can be travelled by both steamboat or gondola. Some of these include: the Basilica di Santa Maria della Salute, the Chiesa degli Scalzi, Ca' Pesaro e Ca' Rezzonico, the Chiesa di San Marzuola, the Chiesa di San Simeon Piccolo, Ca' d'Oro, and many others. 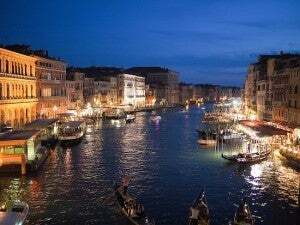 The Grand Canal is also crossed by many famous bridges, first and foremost Ponte di Rialto (Rialto Bridge), followed by Ponte dell'Accademia and by Ponte degli Scalzi. The Grand Canal was once the main commercial waterway of the city, and it became increasingly important right up to today. It’s also the setting for the Regata Storica (Historical Regatta), held each year on the first Sunday of September. This is a race between different boats, which is preceded by the Corteo Storico (Historical Parade), a reenactment of the arrival of Caterina Cornaro, queen of Cyprus in 1489. Admiring the Grand Canal entire beauty is a unique experience that has not only made tourists fall in love, but also artists in every era. Don’t waste any time searching for a parking space when you get to Venice. Book now with Parclick and enjoy a trip in a gondola along the Grand Canal!